A Reminder: This website serves as an objective reference source for the science and art of Body Language/Nonverbal Communication. In an effort to be both practical and academic, many examples from/of varied cultures, politicians, professional athletes, legal cases, public figures, etc. are cited in order to teach and illustrate both the interpretation of others' body language as well as the projection of one's own nonverbal skills in many different contexts - not to advance any political, religious or other agenda. Yesterday Senator Marco Rubio (R-FL) announced his candidacy for the 2016 Presidency of the United States. Without a doubt, the junior Senator from Florida needs to improve his nonverbal skills - and while he has and continues to commit his share (or more) of faux pas, yesterday he displayed an example of a body language signal - of which its underlying emotion we need to see much more of in politics. 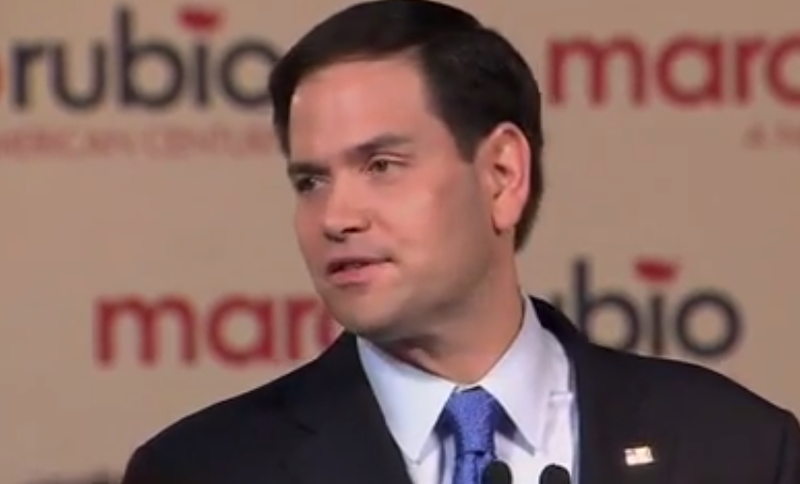 The above video is an edited portion of Senator Rubio's announcement. These three images are taken from the very beginning portion. 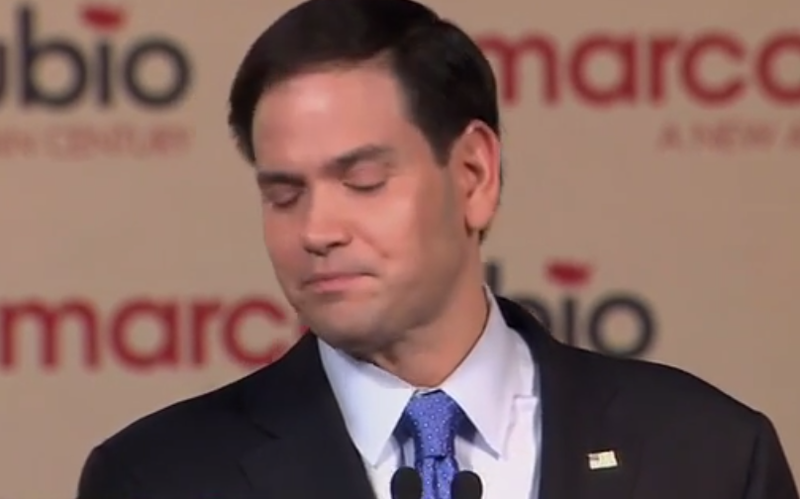 This first image was captured at 0:08, just as he finished up the word, "... States ..."
At 0:09, Senator Rubio closes his eyelids in an extended blink as his face blushes and he suppresses a sincere smile. 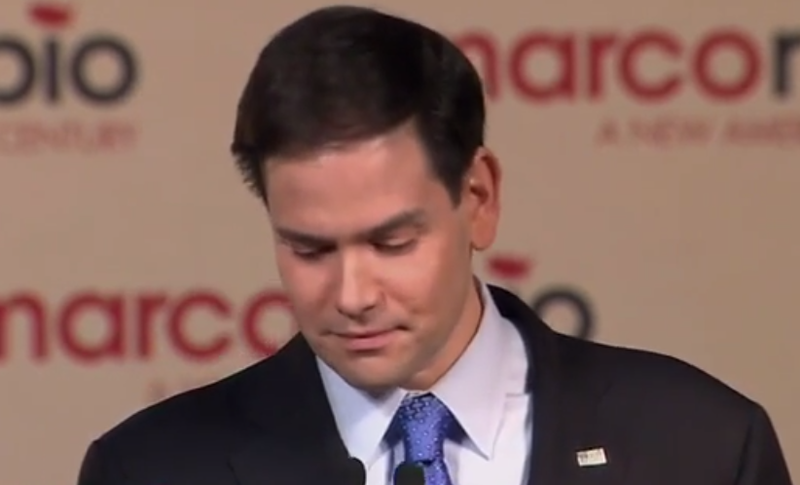 Senator Rubio then looks down to his right (still 0:09 and for several seconds thereafter). In the great majority of right-handed people, when they look down to the right when they are emotionally processing of someone or something close to their heart - a person, an idea, image, repercussion, memory, etc. His prolonged eyelid closure and blushing are also congruent nonverbal displays. Whether you agree with a person's politics or not, it's important to always strive to be objective ("Rationalization is THE great human sport." S.King). More specifically, when assessing any politician - such attempts at objectivity should always involve separating political opinions from character issues. And while no candidate is perfect - in this moment, this particular politician is projecting a very human emotion - he is humbled by what he is undertaking.